You’ve spent a bit of money on your collection of essential oils and are putting them to good use. But, are you storing them properly? This is really important to ensure you get the maximum life from the oils and can enjoy each bottle right down to the last drop. Essential oils can vary in price for many reasons but some are very expensive. The raw plant materials and extraction process determines the cost of individual oils. As a result, some can cost up to hundreds of dollars per bottle. Even those oils that aren’t quite as expensive to produce can start to add up in cost when you begin to get a collection. If you purchase aromatherapy essential oils, they should be stored correctly to protect your investment. Their volatile nature means they are subject to degradation if not cared for. Once they start to deteriorate, the oils will not perform as expected with a reduction in their aromatic and therapeutic benefits. Below is all you need to know about how to store essential oils the right way. Taking the time to do this is worth it as you will enjoy the benefits they have to offer for several years. Storing aromatherapy essential oils in dark, glass bottles is the perfect way to help them last as long as possible. 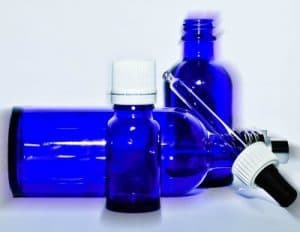 Do not use plastic bottles or clear glass bottles for storing essential oils unless you plan to use the oils up quite quickly and are sure you will be finishing your supply in a relatively short amount of time. You may come across great deals on discounted essential oils because they are stored in plastic bottles. If you want to take advantage of these bargains, make sure the oils have not been in the plastic container for an extended amount of time. It is a good idea to have some extra dark glass bottles on hand so once purchased, you can transfer the oils straight away for extended storage. It is always a good idea to have a few spare bottles on hand anyway, especially if you plan on custom blending aromatherapy essential oils. The best glass bottles to choose from are those that are tinted jade green, dark brown, black or cobalt. Also, it is ideal if they have a drop-by-drop reducer insert so you can control the amount of oil that is dispensed. These can be left in the bottle as they don’t usually remain in contact with the oil and are really handy. For thicker oils, a glass dropper is preferred as they aren’t easily dispensed through these inserts. Once you have used the glass dropper, reseal the bottle with the original lid. The droppers are not suitable to be left on as the bottle lid. Putting your precious oils in dark glass bottles does not completely protect them. It simply keeps damaging light away. The other big enemy is heat. It is important to keep oils stored away from both direct heat and light as these will cause oxidation. If an oil becomes oxidised, the chemical structure will change. This destroys the aromatic compounds of the oil, along with its therapeutic benefits. Ideally, the best place to store your essential oils is in a dry, dark room with a temperature slightly below 70 degrees Fahrenheit (20C). The last enemy of essential oils is moisture. This can occur if the lid is left off the bottle for too long, increasing the time the oil is exposed to air and the chance of water getting into the bottle. When essential oils become exposed to moisture, they will become cloudy. A deterioration in their aromatic and therapeutic value will result. To prevent water affecting your oils is simple. Put the lid back on as soon as you have dispensed the oil and ensure it is tightly sealed. Apart from keeping your oils in a dark, dry cupboard, there are some great options for portable storage. This allows you to take your oils with you to work, when travelling or simply out and about. There is a range of storage boxes, both wooden and soft cover, that come in a range of sizes. From small pouches that can carry a few bottles, to large boxes and carry pouches that can hold your whole collection. When correctly stored, your essential oils can stay in good condition for up to 2 or 3 years. There are some oils that are known to successfully last up to 5 years. If you are not expecting to use much of a particular oil, only buy what you think you will use in the near future, and buy more as needed. Aromatherapy works best if you really like the smell, so before purchasing a variety of oils, experiment with them first. This will ensure you don’t waste money on oils that won’t be used. Visit some local shops and see what you enjoy or dislike first hand. Your preference in oils is a very personal thing, just like perfume. Everyone has their own favourites and some simply ‘work’ better for us than others. Make sure to smell before you buy. Now you know how to store essential oils, protect your investment by using the right methods as outlined here. Keep them in dark bottles with the lid on tight, away from light and heat. My boyfriend is trying to quit smoking and is having a difficult time. Is there an essential oil or combination of oils that could help ease the cravings? Any help would be greatly appreciated! Hi Keilia, here is a great article that may help https://www.aromaweb.com/articles/aromatherapyquitsmoking.asp. Good luck! I am 4 months free of smoking. I began using Quit Sticks. I marinated toothpicks in Black Pepper and Cinnamon essential oils for 2-3 days in a mason jar. Than I transferred them to small container that I could keep in my purse and have them anytime. When the urge came on I used a quit stick to help it pass. They worked wonderfully! Good Luck! Great tips, essential oils are ah-mazing! Thanks for the info!